Silid Aralan KIDS Foldscope Club: The First in the Philippines! On 16 July 2016 marked another milestone for KIDS Club and Silid Aralan, Inc. (SAI) with the creation of the country’s first Foldscope Club. The club consists of eight learners from SAI’s iLead Program mostly Grade 5 and above students. It aims to provide a venue for learners and science enthusiasts to gather and explore science through Foldscope. The club would also like to encourage the students to discover their passion, curiosity, creativity, and critical thinking in science and the environment. Silid Aralan and KIDS Club organized a workshop for learners to have a clear understanding of microscopy and Foldscope. During the workshop, the students learned about the brief history of microscopes, the importance of Foldscope as well as the history, composition, and kinds of cells. They also played a game called Twist and Shout wherein learners needed to form words such as lens, light, etc. After that, they tried to assemble the Foldscope units with the help of the SAI mentors. Ms. Remie Segui, KVES Coordinator, showed the step-by-step instructions on how to assemble the unit. For the newbies, it was an enjoyable experience. Same goes for some who already experienced it during the “Me and My Environment workshop” last April. Once finished assembling, they started making their samples using tomato skin. Next, they examined the tomato skin using Foldscopes. They were amazed by the image of the tomato cell looking through the lens. Mr. Johnson Donato, a Biology Student and LEAP Scholar, assisted the learners during the experiment. He also explained the cells that they saw from the lenses. Finally, the learners drew the image they saw. Same with the previous workshop, each learner had a unique interpretation of the same sample. After the workshop, Mr. Angelo Roxas, SAI Project Leader for Rizal and Foldscope Club Focal Person, presented the purpose and objectives of the club. After confirming their membership to the club, the learners identified their leader, assistant leader, and rapporteurs. They will help the mentors identify and prepare experiment topics and assist the members during experiments. Furthermore, they will assist the mentors and learners during documentation. The club will serve as a champion and benchmark for other Foldscope clubs that KIDS Club and Silid Aralan will establish in the near future throughout the Philippines. 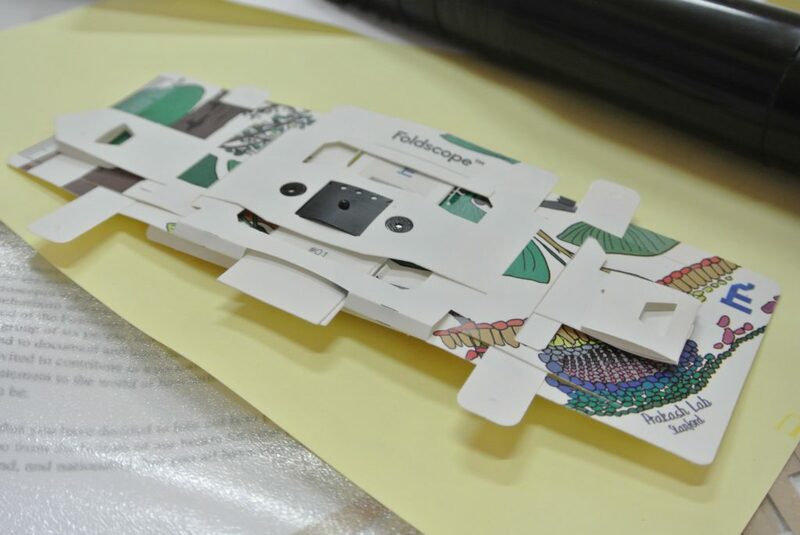 Foldscope is an optical microscope developed by Dr. Manu Prakash and his team from Stanford University, USA. It aims to promote scientific tools especially in the third world by using affordable and easy tools.